Almost 70 percent of the 'Dreamers' eligible for a 2-year work permit extension have applied. More than 100,000 young undocumented immigrants – nearly 69 percent of those eligible – have applied to renew their work permits ahead of a Thursday deadline set by President Trump as part of his decision to end President Obama’s signature deportation-relief program. Despite pleas from advocates in hurricane-ravaged Texas and Florida, the federal government did not extend the deadline to accommodate immigrants in those areas who may have had difficulty gathering the necessary paperwork and $495 fee. However, administration officials said Tuesday that they will accept late filings on a case-by-case basis from Puerto Rico and the U.S. Virgin Islands, which were devastated by Hurricane Maria. 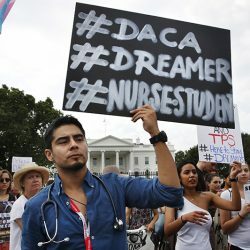 Carlos Esteban, 31, a nursing student and recipient of Deferred Action for Childhood Arrivals, known as DACA, rallies with others in support of DACA outside of the White House in September. Attorney General Jeff Sessions announced the end of the Deferred Action for Childhood Arrivals program on Sept. 5 but gave immigrants whose two-year work permits would expire before March 5 the chance to renew them one last time. As of Tuesday, 106,000 of the 154,000 immigrants eligible for renewals had applied, according to the Department of Homeland Security. Most of the applicants – about 58,000 – made their filings before Sessions announced the ending of the program. That number was not publicly known last month when advocates began a frantic effort to help people renew. Since Sept. 5, about 48,000 more DACA recipients have applied for renewals. More applications were expected to land Tuesday, Wednesday and Thursday, aided by millions of dollars in donations to help pay the renewal fees. There was a happy-hour fundraiser in Brooklyn and a bake sale in Texas. United We Dream, the country’s largest immigrant-youth-led organization, raised enough to help 1,367 people pay for their applications. In San Francisco, the nonprofit Mission Asset Fund raised $3.8 million and was still handing out checks to DACA applicants Tuesday. “We’re trying to get as many as possible out,” said Tara Robinson, chief development officer for the organization, which has helped nearly 5,000 immigrants with their renewal applications in the past month. Federal officials said they did not know what happened to the remaining 48,000 eligible DACA recipients who had not filed their renewal applications by Tuesday. DACA transformed the lives of hundreds of thousands of undocumented immigrants who were brought to the United States as children, allowing them to work legally, attend college, drive and, in some cases, buy homes. Trump, who says Obama did not have the power to create such a program on his own, has challenged Congress to pass an immigration bill that would replace the program and allow the roughly 690,000 young people who have benefited from it to legally remain in the United States. Bills are pending in the House and the Senate that would grant legal status to DACA beneficiaries. But a major sticking point is what concessions – such as increased immigration enforcement and tougher border security – the Republican-controlled Congress and White House will demand in return. If lawmakers cannot agree on a bill by March 5, DACA recipients’ work permits will expire at a rate of roughly 30,000 a month, leaving them unable to legally work and putting them – like all of the nation’s estimated 11 million undocumented immigrants – at some risk of deportation. On Monday, the White House said Trump “wants Congress to act and pass responsible immigration reform, which will include his priorities of massive border security and interior enforcement.” Trump said three weeks ago that he had struck a deal in principle with Democratic leaders, but Republican lawmakers said this week that nothing is set. Young immigrants, meanwhile, are calling for a “clean” Dream Act, a bipartisan measure that would create a path to citizenship for a much larger group of immigrants who arrived as children, some 1.8 million people – with no enforcement strings attached. Last week, scores of demonstrators held sit-ins at congressional offices in support of a legislative remedy. This week, a coalition of business and tech leaders is flying in more than 100 undocumented immigrants to lobby lawmakers. Advocates said they are buoyed by polling that shows strong support for the DACA beneficiaries and others brought to the United States as children. They are also backed by hundreds of business and religious leaders and university presidents. At a hearing Tuesday on DACA, Senate Judiciary Committee Chairman Charles E. Grassley, R-Iowa, said the final deal must include increased enforcement, such as a mandate that all employers use E-Verify, a federal system that checks whether prospective employees are authorized to work in the country. 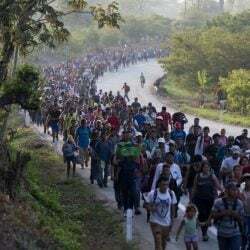 Bob Dane, executive director of the Federation for American Immigration Reform, which favors steep reductions in legal and illegal immigration, said Republicans should insist on changes to immigration policy while they control the White House and both houses of Congress. “They have a carrot, and it’s DACA,” he said. A report from the National Academies of Sciences, Engineering and Medicine released last year found that immigration has a positive impact on the nation’s economy overall, but not for everyone. Native-born workers and immigrants who did not finish high school had lower wages because of competition for jobs. However, the adult children of immigrants end up contributing more in taxes, per capita, than their parents or native-born workers because they are more educated and earn more. Young immigrants say, however, that they oppose measures that would protect them but not their parents and other undocumented immigrants.